This Thursday we brainstormed on a large inflatable light installation we're creating for a local light festival. The inflatable will be between 100 and 200ft long and between 3ft and 6ft in diameter. The inflatable will be filled with color changing LED strips creating a massive lantern we call "GlowWorm". We'll be working on the GlowWorm during the month of November and it will be displayed locally in early December (official announcement coming soon). 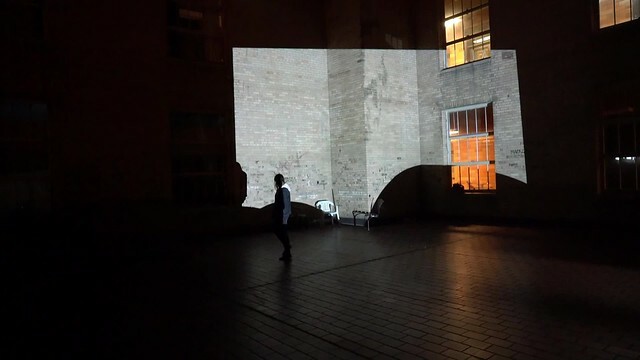 After sketching out ideas for the GlowWorm we went up to the roof of Inscape Arts and did some tests with our projector. We were looking at how far we could project, how large we could project and how we could make it interactive. There are a few tools to do digital graffiti but we discovered that a simple iPad drawing app was a better solution (using a black background). We think this technique could be used in a few ways, with artists doing live murals while the public watches or by asking the public to do the drawing themselves. Our 3,300 lumen projector turned out to be strong enough to project onto the side of Centurylink which is approx 1/2 mile away. It's very faint but we were pretty excited that it could perform over a distance (and against street lights). You'll notice that the building a block from where we are is showing the projection quite well. Utilizing distortion to our advantage. We also played with having the projection interact with an actor.